It's been a little bit of a frustrating weekend. Our refrigerator is beeping for no discernible reason. I can't get some of the photos from my phone to upload to my computer no matter what I do. My running injuries that have been getting so much better have resurfaced. No one in my family will watch the Olympics with me. I can't get my two white cats to pose together nicely for a photo regardless of how many cans of cat food I hold above my head. Really, I have no shortage of frustrations. I am always trying to get a perfect photo of all three of them. I don’t think this qualifies as perfect, but it’s happy and that might be better. * Quinn is the half person. 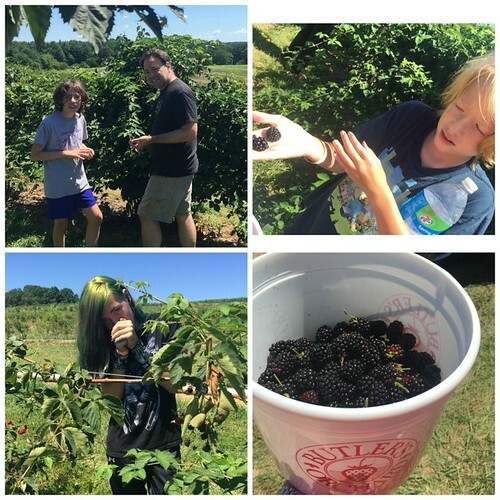 He kept talking about how delicious the blackberries were and how he'd forgotten that he liked them, but I was so busy picking berries that I didn't see what Alex did, which is that Quinn kept putting them in his mouth and spitting them out. I think he was confused by sweet and tart. 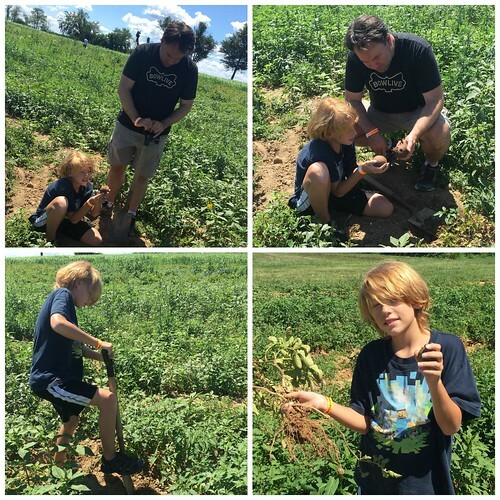 It turns out that the farm where we picked our berries also had a pick-your-own-potato section and, bizarrely, picking his own potatoes is something Quinn has really been wanting to do. What a happy cowinkydink! 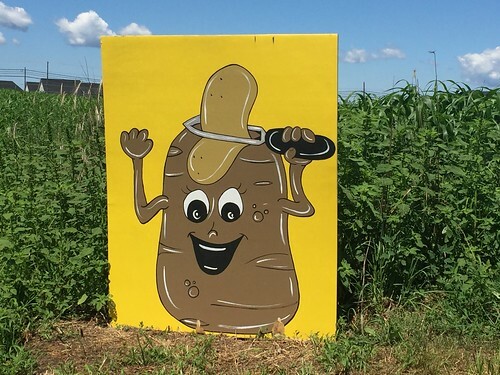 WHAT THE CHRIST IS THAT POTATO DOING TO ITSELF?! Leaving the grim cartoon sign behind us, Quinn and Alex headed out into the tuber fields to dig themselves some taters. Shortly after I took that photo in the upper right, Quinn took a bite out of a raw, dirty potato. As with the blackberries, he spit it out. 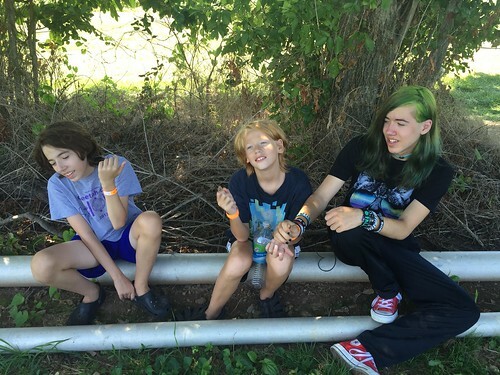 I'm still frustrated about my refrigerator, etc., but outings with my family go a long way in making things better. 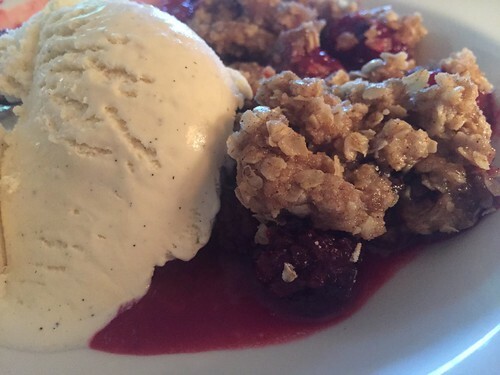 Especially when they end with blackberry crisp and ice cream. I’m going to eat it for breakfast tomorrow too. What a fun day. And that blackberry crisp looks awesome! But so sorry you are having problems with your running!!! Maybe you refrigerator is crying out for help, maybe it has appendicitis? If I lived closer, I would be over for breakfast. That vanilla ice cream looks amazing too. I love a good vanilla ice cream. It is much too much stress to run in this heat. Heal yourself until it cools down. End of my playing mother... and at 78 I have never been a mother. ? Happy Summer, Team Stimey. Sorry about running injury. Hugs to you. THERE IS NO BETTER BREAKFAST THAN FRUIT CRISP/COBBLER WITH ICE CREAM. Plus, it is basically oatmeal with fruit and milk. I loved the reaction to the potato sign. I think that picture of the three boys definitely qualifies as perfect, especially for the long run: later on, a picture of them sitting stick-straight in sweater vests wouldn't be NEARLY as satisfying.